HAFA ADIVE: Mariannense or Fasciola? Found the above for Saipan fairly common worm orchid the other day. Finding information about this little plant has been harder than finding the actual plant eventhough it is smaller than my fist. The experts don't seem to agree on what plant it is. It is either Taeniophyllum Mariannense which like the name suggests is endemic to the Marianas or it is the Taeniophyllum Fasciola found in American Samoa or the two are one and the same. Either way it is an orchid that's really all I wanted to know. What's in a name? Right now it is flowering (4/12). Here's a picture of the miniscule flower. Update (4/15): Looks like it is Taeniophyllum Mariannense instead of Taeniophyllum Fasciola and they are different. The lavender dots don't seems to appear on the Fasciola. The flowers are open for only one day. It so happens that I found three of these orchids and all three were flowering the day I took the picture above. 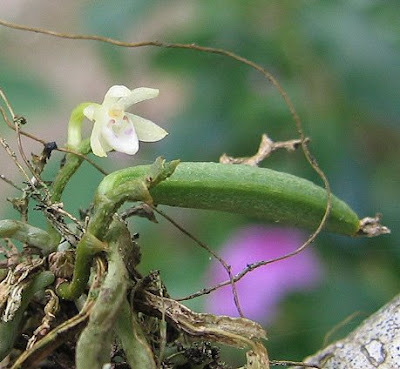 Some general info: The epiphytic genus Taeniophyllum has diminutive flowers, scarcely larger than a pinhead. There are some 200 species, most of which occur in Asia. 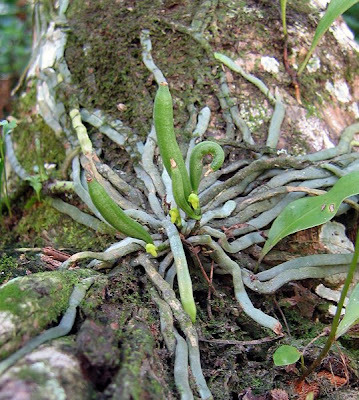 Like the members of the African genus Microcoelia, taeniophyllums have small brown scales instead of leaves and the process of photosynthesis is carried out in the green roots. Most members of this genus grow upon the twigs of rain forest trees and in cultivation they respond well to constant air movement and a high relative humidity.